Bank of Ireland UK, sponsor of the Twilight Market at St George’s in Belfast which provides a golden opportunity to buy special and unique gifts from local artisans and producers in the approach to Christmas, welcomed ten stall holders to the opening night of the first ever Christmas Twilight Market which will run until Wednesday 12 December. Each of the ten small businesses secured their stall via a competition run by the bank to win a coveted place to showcase and trade at what promises to be a very busy two nights. 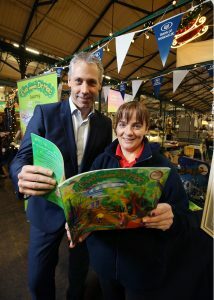 Pictured at the launch is Gavin Kennedy, Head of Business Banking (NI), Bank of Ireland UK with Kellie Toal of Eva’s Adventures a company that produces children’s picture books, written in verse and fully colour illustrated to help children deal with the side effects of living with life threatening illnesses in a child-friendly and adventurous manner. The business was set-up in 2017 following writer Tracy Hughes’s niece Eva’s diagnosis with a brain tumour. Last month, their first professional publication, Eva Meets Dr Mac was shortlisted as an American Book Award finalist in November 2018. 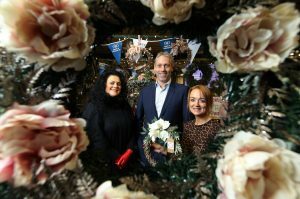 Pictured at the launch is Gavin Kennedy, Head of Business Banking (NI), Bank of Ireland UK with Louise Morrow of Jasmine and Lily Floral Wreaths based in Armagh who designs and creates handmade faux floral wreaths for doors, weddings, interiors, memorials and gifts that are bespoke and unique.